Are there alternatives to metal braces? Orthodontics is the area of dentistry that specializes in the diagnosis, supervision, guidance and correction of problems involving the alignment of the teeth and jaws. The technical term for these problems is “malocclusion”, which means “bad bite”. The practice of orthodontics requires professional skill in the design, application and control of corrective appliances, to prevent and treat dental and facial irregularities. What causes orthodontic problems (malocclusion)? Many malocclusions are inherited, which means genetics plays a key role in their appearance. Inherited problems include; crowding of teeth, too much space between teeth, or the improper alignment of the teeth to each other. Another cause of malocclusion is acquired characteristics. This happens by trauma (accidents), thumb; finger or pacifier sucking causes some acquired malocclusion. Whether inherited or acquired, many of these problems affect not only permanent alignment of the teeth but facial development and appearance as well. Crooked and crowded teeth are hard to clean and maintain. This may contribute to conditions that cause not only future tooth decay but also eventual periodontal disease and potential tooth loss. Orthodontic problems can also contribute to abnormal wear of tooth surfaces, inefficient chewing or misalignment of the jaw joints, which can result in chronic headaches or facial pain. If left untreated, many orthodontic problems may become worse. Orthodontic treatment to correct the problem, is often less costly than dental care to treat the problems that can develop in later years. Children and adults can both benefit from orthodontics, because healthy teeth can be moved at almost any age. Because monitoring growth and development is crucial to managing some orthodontic problems, the Indian Association of Orthodontics recommends that all children have an orthodontic screening no later than age 7 yrs. Some orthodontic problems may be easier to correct if treated early. Waiting until all the permanent teeth have come in, or until facial growth is nearly complete, may make correction of some orthodontic problems more difficult. An orthodontic evaluation at any age is advisable if a parent, family dentist or the patient’s physician has noted a problem. Straightening the teeth can be accomplished in several ways. Your dentist or orthodontist will recommend the best option for you. 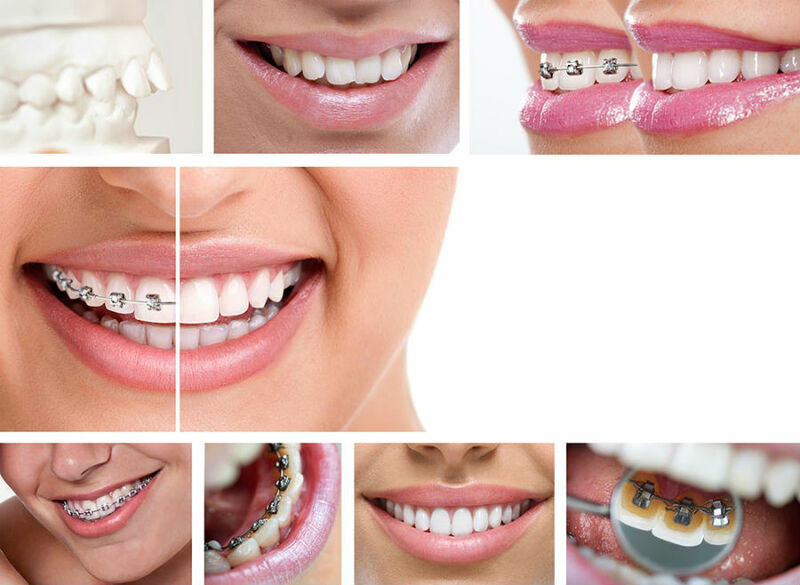 Custom-made appliances or braces are generally prescribed and designed according to the problem being treated. They may be removable or fixed (cemented and/or bonded to the teeth). They may be made of metal, ceramic or plastic. By placing a constant, gentle force in a carefully controlled direction, braces can slowly move teeth to a new desirable position. Other orthodontic appliances use carefully directed forces to guide the growth and development of jaws in children and/or teenagers. Many people have some discomfort after their braces are first put on their teeth or when adjustments are made during treatment. After braces are placed or adjusted, teeth may become sore and may be tender to biting pressures for two to three days. The orthodontist may recommend pain medication commonly used . The lips, cheeks and tongue may also become irritated for two to three days as they become accustomed to the surface of the braces, and can be alleviated or controlled by wax that your orthodontist will provide and proper rinsing. Overall, orthodontic discomfort is short-lived and easily managed. Today’s braces are generally less noticeable than those of the past when a metal band with bracket (the part of the braces that hold the wire) was placed around each tooth. Now the front teeth typically have only the bracket bonded directly to the tooth. Brackets can be metal, clear or colored ceramic, depending on the patient’s preference. In some case, brackets may be bonded behind the teeth (lingual or tongue side braces). Wires are made of materials that exert a steady, gentle pressure on the teeth, so that the tooth-moving process may be faster and more comfortable for patients. Many of today’s treatment options are designed to minimize the appearance of the appliances and better fit active lifestyles. The orthodontist and team will teach patients how to best care for their teeth, gums and braces during treatment. The orthodontist will instruct patients (and/or their parents) how to brush, floss, and, if necessary, suggest other cleaning aids that might help the patient maintain good dental health. Keeping the teeth and the braces clean requires more precision and time than normal cleaning, and must be done two to three times every day if the teeth and gums are to be remain healthy during orthodontic treatment. Patients with braces must be careful to avoid hard and sticky foods. They must not chew on pens, pencils or fingernails because chewing on hard things can damage the braces. Damaged braces will almost always cause treatment to take longer, and will require extra trips to the orthodontist’s office. If the patient plays contact sports the orthodontist may recommend a special mouth guard to protect the braces and the patient’s lips, tongue and teeth. Braces usually do not interfere with the playing of musical instruments, but practice and a period of adjustment may be necessary. Talk to your dentist about your questions and concerns regarding orthodontic treatment.